Configuration files in Apple's latest beta of OS X 10.11.1 reveal a trio of new hardware updates likely to arrive soon: a new Magic Trackpad 2 and Magic Mouse 2, plus a Magic Keyboard. 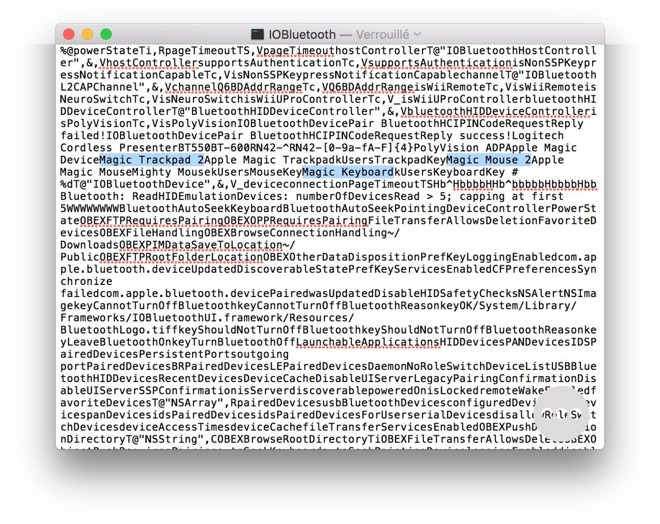 Digging inside the Bluetooth settings of the third beta of OS X 10.11.1 El Capitan, Consomac discovered that Apple has three new input devices on the way, all with "Magic" branding. Specifically, the inclusion of a Magic Trackpad 2 is noteworthy because it was not included in FCC filings that surfaced in August. Those Federal Communications Commission documents did disclose that a new Magic Mouse and Apple wireless keyboard will soon arrive, both with integrated rechargeable batteries. Both of those devices were also revealed to feature Bluetooth Low Energy support, something the new Magic Trackpad will also presumably boast. It's likely that both the new Magic Mouse and Magic Trackpad will feature Force Touch input, which Apple introduced in the integrated MacBook and MacBook Pro trackpads earlier this year. Force Touch trackpads offer new input methods, such as a "deeper" click enacted with a more forceful press on the surface. Force Touch trackpads do not actually move or "click" like legacy trackpads. Instead, Apple's technology allows for thinner designs by simulating the feeling of a click, thanks to the company's proprietary Taptic Engine. Force Touch was rebranded as 3D Touch on the new iPhone 6s, but the Force Touch naming remains on marketing materials for the MacBook lineup, as well as the Apple Watch. It's unknown whether Apple plans to rebrand Force Touch as 3D Touch on its other, non-iPhone devices. As for a new Apple keyboard, giving it the name Magic Keyboard would bring its branding in line with Apple's wireless mouse and trackpad. However, there has been no indication that Apple plans to make any other changes to the keyboard, beyond an integrated battery, that would play into the "Magic" name. Apple is rumored to launch a new 21.5-inch iMac with 4K Retina display next week. Considering the all-in-one desktop's reliance on Apple's wireless mouse, keyboard and trackpad for input, it would be an opportune time for the company to introduce those updated accessories as well. The third beta of OS X 10.11.1 was issued to developers on Wednesday. It too could publicly launch next week, if it's required to run Apple's latest Bluetooth accessories.